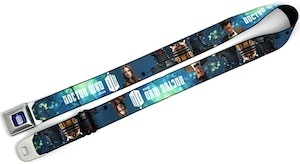 A seatbelt style Doctor Who belt that has everything I expect from Doctor Who. The belt shows the Doctor Who logo on the belt and the buckle and even has “Doctor Who” printed on it and there is much more. Amy Pond, the 11th Doctor and even a Dalek or two. Yes this belt is pretty busy but that also makes it perfect for Doctor Who fans that like it all. And don’t worry this Doctor Who belt is adjustable in size so that it will fit most adults. Maybe this Doctor Who belt is not for fancy dress up occasions but it surely is fun for school and casual wear. Stop wearing boring plain belts and start wearing this Doctor Who Amy, Dalek And The Doctor Belt.